Napped woollen pool cloth to recover the bed and cushions of UK pool tables up to 7ft in a choice of Green, Red or Blue. 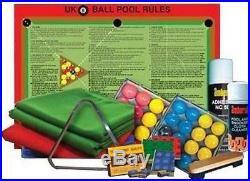 Set of standard UK pool balls (either reds and yellows or blues and yellows). Spray cloth adhesive (to fix bedcloth to slate). Sheet rules of UK pool. These products are normally available from stock and will be dispatched within 2 to 3 days of order confirmation. The item "Pool Table Cloth Recovering & Pool Accessories Kit for 6ft & 7ft UK Pool Tables" is in sale since Monday, February 4, 2013. This item is in the category "Sporting Goods\Snooker & Pool\Table Covers". The seller is "titan_sports_and_games_ltd" and is located in Neston. This item can be shipped to United Kingdom.